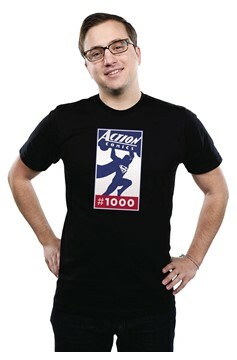 Action Comics turns 1000 this year with the relaese of Action Comics #1000. To commemorate this 80 year landmark, we have two new shirt designs. Action #1000 Logo features a multi-color imprint on a black shirt. Action #1000: Superman features the art of Jim Lee integrated with the elemenst from the cover to Action Comics #1. The Man of Steel turns 80...Happy Birthday!! NOW AVAILABLE for sale in Canada and U.K..